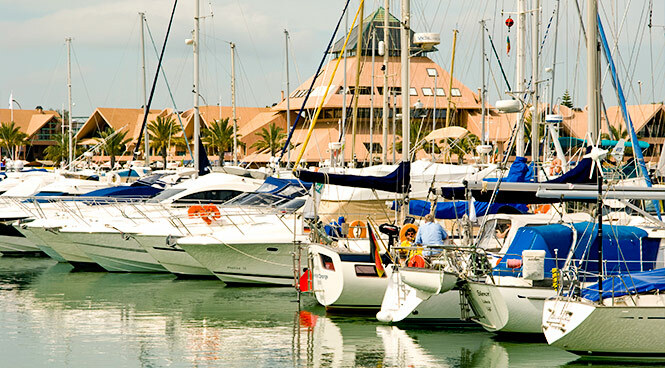 At the heart of Vilamoura is the largest marina in Portugal, busy by day and buzzing by night. Despite the neatly aligned millionaires’ yachts, this is not a pretentious place and anyone with a passion for boats will be in heaven just sitting in a bar or café absorbing the sights, sounds and smells. It’s a great place for a stroll in the sun, watching the boats come and go and spotting celebrities at play. Vilamoura, which means 'Village of the Moors', was once a few dwellings clustered around a small harbour, but is now one of the largest man-made resorts in Europe. The construction process uncovered the ruins of the original Roman town, Cerro da Vila, now with its wall murals, crematorium, wells, grain silos, stables, wine press and baths for the fisherman preserved as a museum. Today Vilamoura offers just about every sport, entertainment and leisure activity you can imagine – and even a few you can’t! There is a riding school, 50 outdoor tennis courts, top quality golf courses, 2 grass greens for lawn bowling, a shooting range and trails for walking and cycling. If you fancy learning Tai Chi or want to belt out your best karaoke number, you can do it here. You’ll be spoilt for choice! There are boat trips to explore caves or go deep sea fishing, or you can try jet skiing, parascending – or bird watching! Ardent shoppers are well catered for with more designer boutiques than you can do in a day, and arcades packed with jewelry, shoes, luggage and handbags, perfume and beachwear. Although Vilamoura is a huge and ambitious tourist centre, it has been tastefully developed with consideration for the natural landscape. The beaches are lined with high rise hotels and apartments, luxury villas, shops, restaurants, bars and night clubs, but because most of it is owned by the same organisation, there is an element of planning that ensures the architecture is less haphazard than in many other resorts. There are gorgeous, safe beaches on either side of the marina with soft sand stretching as far as you can see in both directions. 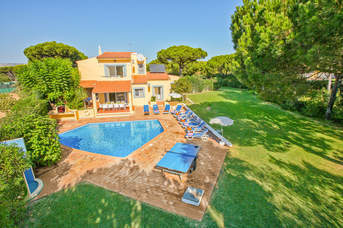 Vilamoura Beach on the eastern side is easy to reach via a boarded walkway which is accessible from the car park. On the western side is the Praia da Rocha Baixinha which, as you walk towards Albufeira becomes Praia da Falésia. There is plenty of parking behind the beach, and a bridge over the river leads to another boarded walkway, making it easily accessible for wheelchairs and buggies. Both beaches have plenty of sun loungers, bars and restaurants, and if you are feeling energetic, there are pedaloes, banana boats and jet skis on offer. One of the Algarve's three casinos is housed in a beautiful building near the marina at Vilamoura. It has regular shows and dances as well as gaming rooms. Dress is formal, and gentlemen are usually required to wear a jacket and tie. Don’t forget your passport as you may need it to get in. Gamblers will be spoilt for choice. As well as over five hundred slot machines, you can play Baccarat, Portuguese Dice, French and American roulette, Blackjack and Poker. There is even a bingo room!